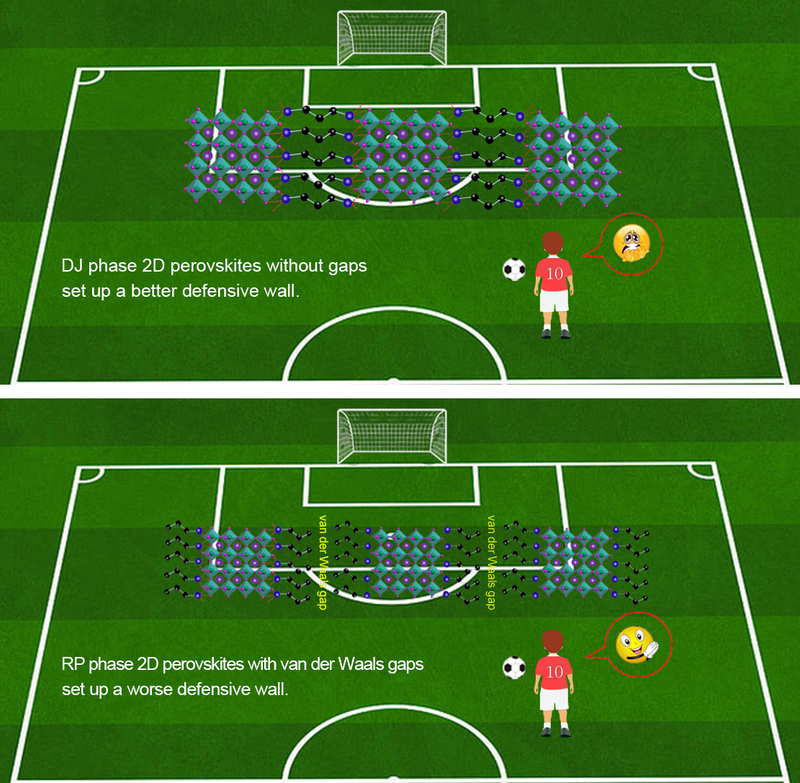 How to set up a defensive wall in a soccer game? No coach likes a gap between defensive players in the wall. Scientists are doing the same when they try to improve the stability of perovskite solar cells (PSCs). A research team, led by Prof. GUO Xin and Prof. LI Can from the Dalian Institute of Chemical Physics (DICP) of the Chinese Academy of Sciences (CAS), improved the stability of PSCs by removing the gaps, called van der Waals gaps, in widely studied Ruddlesden-Popper (RP) phase two-dimensional (2D) layered perovskite materials. The newly developed materials are a series of Dion-Jacobson (DJ) phase 2D layered perovskites which, without gaps, have an extremely stable structure and can defend against attacks from moisture, heat and light more efficiently, leading to outstanding stability of PSCs under various harsh testing conditions. The team’s findings were published in Joule on Dec 21. 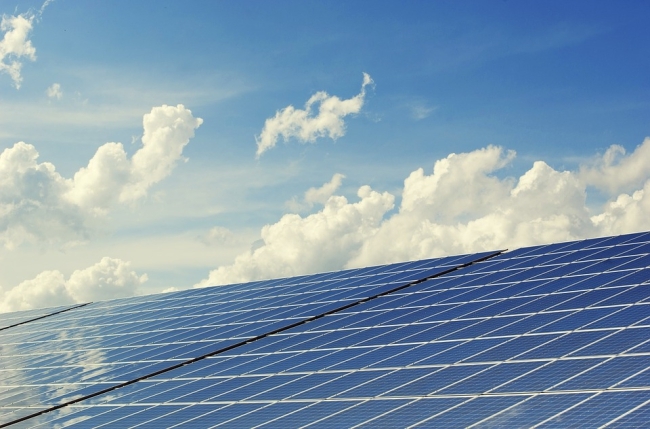 PSCs have shown great promise as a candidate for next-generation photovoltaics. However, their instability limits further development because of the poor structural stability of conventional organic-inorganic hybrid perovskites (3D ones), which are usually used as the light-harvesting materials in PSCs. The 2D layered perovskites have attracted a lot research interest in recent years because they offer better stability than traditional 3D analogues. In most cases, the term "2D layered perovskites" refers to RP phase ones, in which van der Waals gaps are present. 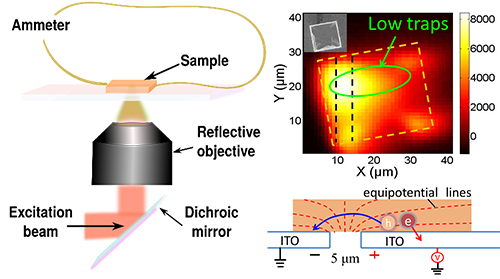 These gaps create weak interactions between layers, thus lessening the stability of the layered perovskite structure and the device. 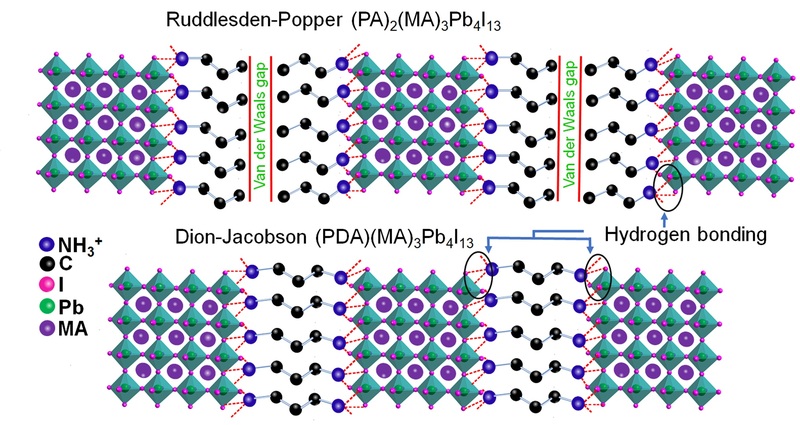 "In contrast with the RP case, our DJ phase 2D layered perovskites are formed by alternating hydrogen bonds between organic layers and inorganic layers with no gaps, which makes their structure more stable," said Prof. GUO. "External stresses like moisture, heat and light cannot easily degrade such materials. This is just like a defensive wall in a soccer game. Imagine that each defensive player is an organic layer or an inorganic layer in 2D layered perovskites. If they stand next to each other in a row, the kicker cannot easily make a goal. If there are gaps between players in the wall, the kicker can score easily, which is just like the situation in RP 2D layered perovskites," GUO explained. More energy from external stresses is needed to degrade DJ phase 2D perovskites than their RP counterparts. As in a soccer game, a banana kick has to be made to bypass a good defensive wall, so it is more difficult for the kicker. "Indeed, the PSCs fabricated using our materials exhibited more outstanding stability than those using 3D and RP phase 2D perovskites," said Prof. LI. "Our unsealed devices can maintain 95% of initial efficiency upon exposure to various harsh stresses, including being stored in ambient air for 4,000 hours, heated at 85 oC with relative humidity of 85% for 168 hours, and continuously illuminated for 3,000 hours." "The highest efficiency we obtained from the PSCs made from our 2D perovskites is just over 13%. Although this is one of the highest values among 2D PSCs, it lags behind the state-of-the-art efficiency of 3D PSCs. Therefore, more effort needs to be made to further improve the efficiency of these 2D PSCs," the DICP researchers said in their report.